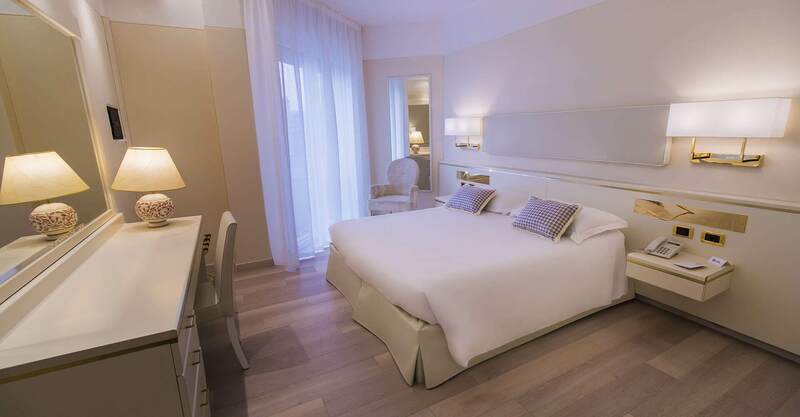 The 4 star Bristol Hotel in Sottomarina has 65 lovely rooms with sea view, that are bright and elegantly furnished, where you can relax after a day of regenerating freshness by our pool. 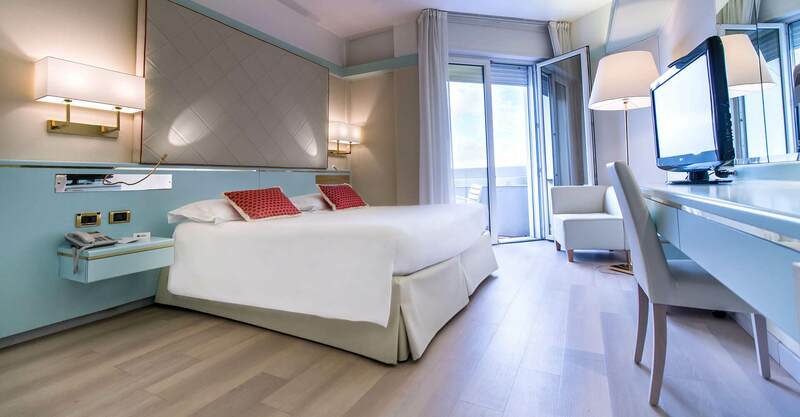 Vast, comfortable spaces, perfect for families as well as a romantic weekend for two, enjoying the food and wine delights offered by Chioggia, like the fresh fish from the Adriatic, the famous Chioggia Radicchio and the numerous local market garden products. In our non smoking rooms simplicity combines with comfort to make your holiday and business trips unique; the rooms are air conditioned and fitted with safes, Internet Wi-fi, satellite TV and direct telephone line. Basic category room with quite internal view as the perfect combination of convenience and essentiality while not loosing modernity and comfort. Great for budget travellers. 12 sqm, up to 2 guests. Quiet room suitable for 1 person. Equipped with french size bed, modern furniture, luminous window with internal view, provided with every modern comfort. Congenial accommodation for leisure as well as for business stay. Quiet double room with view on internal courtyard. Fitted with modern furniture, it is the perfect solution for having quiteness combined with comfort. Perfect for business and leisure stays. Sea view comfortable double room for 2 persons with queen size or twin bed. Is provided with nice balcony overlooking the Hotel garden and swimming pool. It’s the perfect combination of elegance and comfort for a pleasant stay. Our superior category rooms with nice sea view balcony are suitable for 3 persons, thay allow a flexible bed repartition: 1 queen size + 1 single bed or 3 separate beds. They are provided with functionally elegant furniture and offer every modern comfort. The best solution for friends and families on holiday. 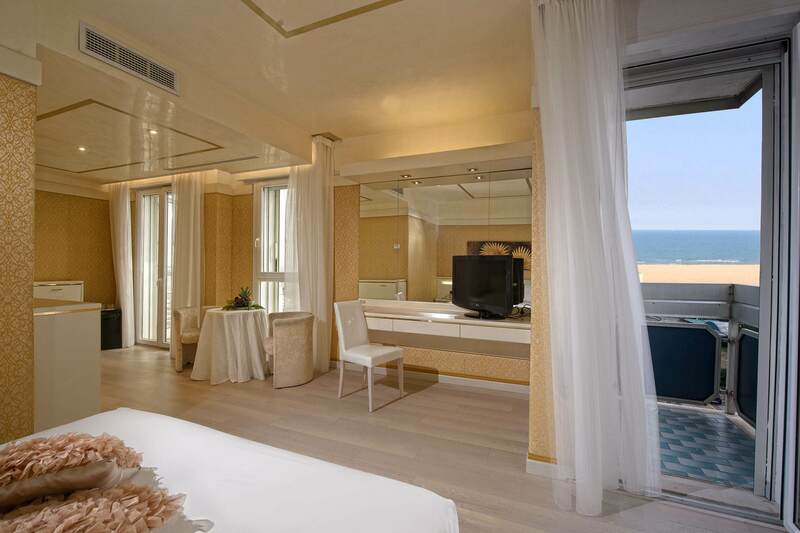 Executive elegant room with window and 2 balconies overlooking the sea and the long beach of Sottomarina. Suitable for 4 persons, it allows a flexible bed repartition: 1 queen size + 2 single beds or 4 separate beds. Spacious and fitted with every modern comfort is the perfect inviting accommodation for friend groups and big families on holidays.